Senate President Pro Tem Martin M. Looney, D-New Haven. 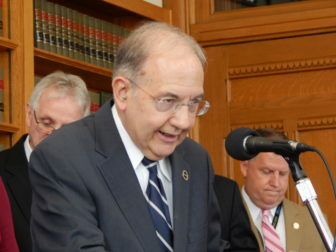 The two bills that would establish an individual mandate in Connecticut have failed to make it out of committee, but Senate President Pro Tem Martin M. Looney said Wednesday he would consider reviving the proposal by offering an amendment to other legislation. The two bills — one by Gov. Dannel P. Malloy, the other raised by the insurance committee — were aired at a public hearing earlier in March. The proposals would impose radically different fines for those who fail to buy health insurance coverage. “If we don’t come back to it this year, I think we’ll come back to it next year,” Scanlon said. Larry Perosino, spokesman for House Speaker Joe Aresimowicz, D-Berlin, said the speaker “is always supportive of finding ways to improve access to quality affordable healthcare.” But, he said, Aresimowicz is not planning to propose an amendment. “Going forward, of course, a member can always introduce legislation as an amendment to another related bill in committee or on the House floor,” Perosino said in an email. 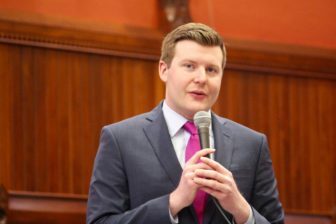 Leigh Appleby, a spokesman for Malloy, cited Congressional Budget Office projections that elimination of the individual mandate penalty will lead to 13 million people losing their health insurance and premiums increasing by more than 10 percent. Under a bill Malloy submitted, residents would be fined $500 or 2 percent of their income annually if they didn’t comply with the state mandate for the entire year — or 1/12th of that for each month not in compliance. The second bill, introduced by the insurance committee, was inspired by a research paper by Fiona Scott Morton, an economics professor at the Yale School of Management. According to the committee’s bill, if residents failed to have coverage, they would face a penalty of 9.66 percent of their income each year, capped at $10,000. But the bill would provide a choice — pay the penalty or put 9.66 percent of income each month into a health savings account managed by the state. Residents could withdraw money from their account as long as it was for health care expenses. According to the Yale paper, health care is considered affordable when all payments — including premiums and out-of-pocket costs — equate to 9.66 percent of income. This is the definition that the ACA uses. The Internal Revenue Service reported that 60,000 state residents paid the federal penalty in 2016, the Yale paper said.